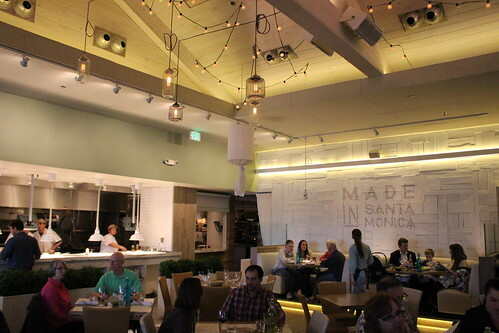 A restaurant named after Santa Monica will have some Californian cuisine, of course, and apparently that includes sushi rolls, salads, and tuna tostadas, among other things. 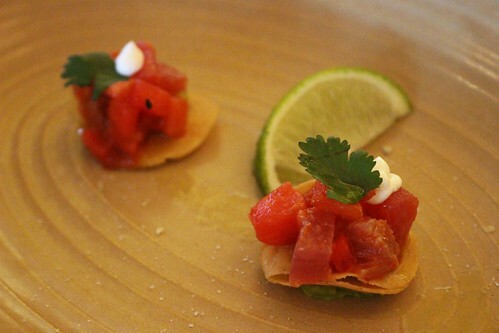 The Ahi tuna tostadas were combined with watermelon, thai chili, avocado, crema, clantro, lime, yellow corn tortilla (shown below are bite-sized samples given to us to try). What at first seemed to me like normal tuna tostada was made much better and more interesting with the small cubes of watermelon, which looks deceptively similar to the tuna chunks and made for a surprising bite. 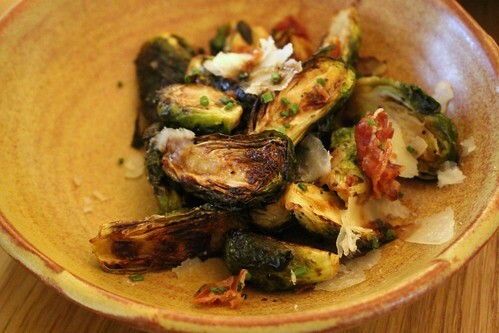 Caramelized brussels sprouts, pancetta, modena vinegar ($8.95). This was a lovely charred rendition of the popular brussels sprouts side dish. I had to try one of their handmade pastas, and after much deliberation, ordered the chitarra with beef cheek sugo and pecorino ($19.95, half an order shown below). 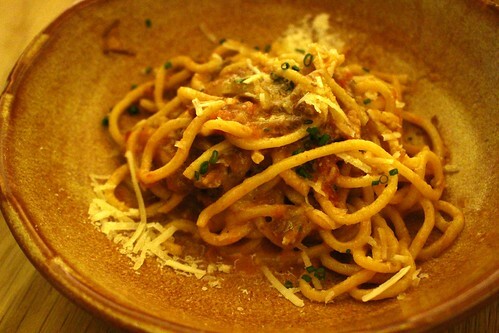 The pasta is hand-cut, al dente, and covered in the savory, comforting sauce. There's a small selection of cocktails, mostly featuring fresh fruits (rather than stirred cocktails), and a nice beer and wine list. 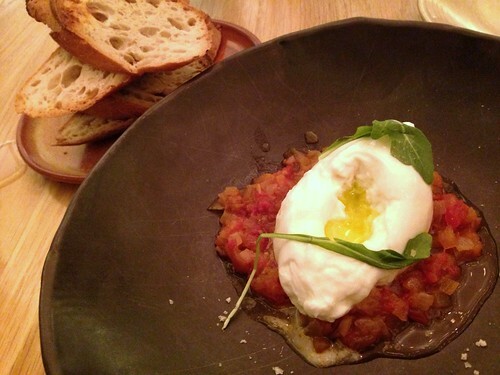 They paired a Brooks Riesling from Willamette Valley with the burrata, and I was impressed with the pairing. There are still many other sections on the menu that I didn't get to - I can only eat so much ... but I was also curious about their steak frites and the curry quinoa bowl. It'll have to wait until next time! 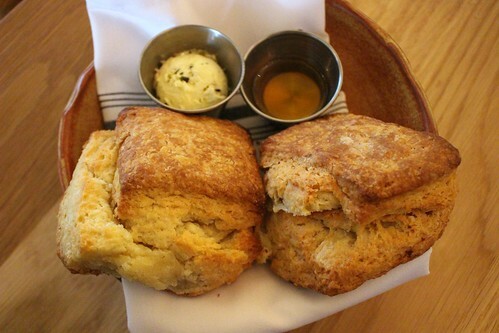 For dessert (or second desserts, or tomorrow morning's breakfast), head over to the pastry case for some awesome cookies. 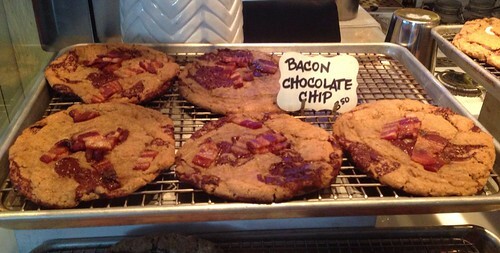 Bacon chocolate chip, anyone? 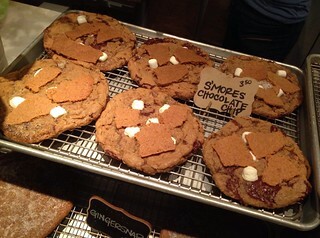 Or maybe some S'mores Chocolate Chip? After spending the brutal winter in Boston (OK, I escaped to LA a few times), it was nice to be reminded of Santa Monica while dining here. 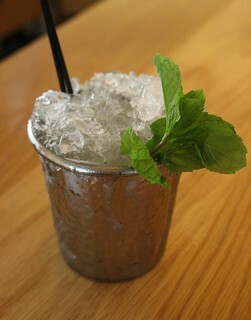 That's the idea of opening Summer House in places like Chicago and DC! Part of the menu reminds me of Jeff Mahin's familiar dishes from Stella Barra (which is now open next door to Summer House), while he has also put his own touches to California-style items like the tuna tostada and a quinoa bowl. By the way, Chef Mahin and other chefs are bicycling 300 miles to raise funds for No Kid Hungry. He's even doing the ride on both coasts! Please help support or spread the word through these links fo the West Coast and East Coast.